1. The decision to pin baste or spray baste is a delicate balance between the tedious nature of pin basting and paranoia that inhaling aerosol glue fumes is going to cause me some sort of invisible bodily harm. In the back of my mind, adhesive mist is to be feared. I blame this phobia on my previous pregnancies. I started reading labels, and much to my dismay, many had warnings about about the products causing cancer in California. Is it too much to hope that the product's cancer-causing tendencies do not extend to New Mexico? I suspect so. Soon I realized wall plaster, and super glue, and spray paint, and about every craft item I touched had some sort of ominous warning. 2. I hand sewing the binding onto the back side of every quilt because, in spite of my efforts, I always miss sections when attempting binding entirely by machine. 3. I stopped going to the local quilt shop where I took my first quilt class since they took in several cats, and I'm wildly allergic. I don't mind blog posts featuring pets though; I've had no allergic reactions via the internet. 5. I don't prewash my fabrics, but sometimes they have bled and made me wish I had. But, I like to live dangerously, so I still don't. Besides, then I'd have to iron them, and if I enjoyed that I'd get to the big ol' pile of clothes under my ironing board. 6. 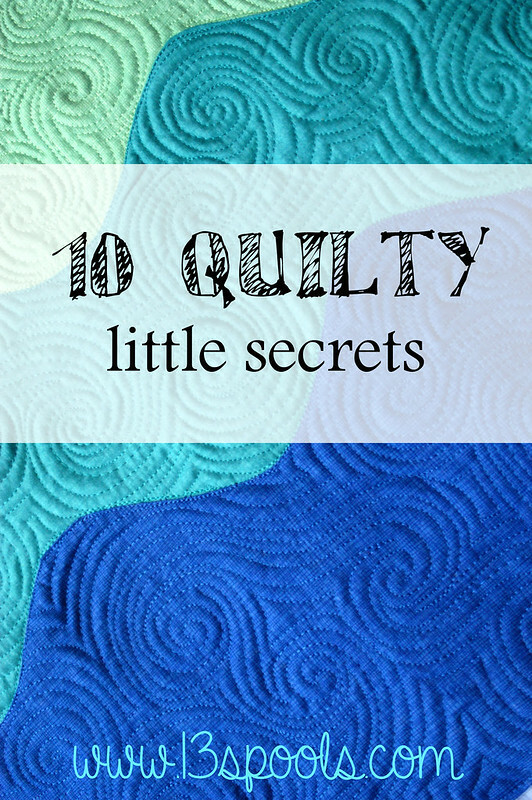 I like to make smaller quilts since I have an irrational fear of being smothered by the bulk as I free-motion quilt larger projects. A rational fear would be the potential of being smushed beneath my fabric hoard with my legs sticking out like the wicked witch of the west without the awesome striped socks. Note to self: Buy striped socks. 7. I collect fabric and UFOs. I've lost track of how many UFOs I have. I'm not going to count either because I'd rather start another project. 8. I press to the side almost always. 9. Partial seams and English paper piecing scare me, so I stay away from them as if they were contagious diseases. 10. I run over my pins, but I use the skinny glass head ones, so it's ok. It's harder to hit a smaller target. 12. I learned the hard way about purchasing expensive, heavy sewing machines on eBay. Then, I learned you should forfeit your shipping cost and send the machine back to the eBay seller right away when it arrives damaged instead of trying to get it fixed. You will avoid shaming yourself at local businesses in a futile effort to correct the machine's maladies. The seller will get all their money back from FedEx, regardless of how badly the machine was packaged, but you won't. Bummer. You will feel stupid and ashamed because you wasted money that could have been spent on your fabric collection. And you are cheap. Or maybe that's just me. I'm with ya, especially on #5! Today at Modern Quilt Guild we had a big discussion about whether or not to prewash since somebody's blue batik bled on one of our group quilts. The president called it "crocking" which I had never heard before. Afton this made me chuckle a lot. Number 5 for me too!! So I always use colour catchers when I wash a finished quilt. 4 usually. I am with you on the Color Catchers. I throw in a bunch, and keep reusing them until they are very red. I think my daughter's mostly pink wardrobe is responsible for this. Your note to self should read: Get striped socks that go up and down on their own. I need to get some skinny glass head pins! I use pins my mom bought when I was a kid, and I've slowly learned that even pins can be improved upon. Denyse Schmidt, AMH and Tula Pink as a whole don't excite me--some of their lines are very pretty, but usually each line only has one or two fabrics I'd like to have. For me the decision to pin vs spray baste depend on how much cleaning I would need to do before and/or after. I hate cleaning the over spray, and it's there even if I put paper around the quilt before spraying. Blehk. If only I knew where to find them. My best guess would be the front section of target with the As Seen on TV items. The had animal hats with a bulb of air. If you squished it, the ears would stick up. Yes, I did try it. It's totally acceptable though because the kids were with me. Oh my! You really need to get yourself some of the Clover glass-head pins with the green and orange balls. I suppose it helps not to love an entire fabric line. That gets too expensive anyhow. I forgot about overspray. My laptop screen still has a bit of a texture due to this. I know not moving it farther away was dumb, but it's too late now. I'm totally there with you on 4, 8, and 9! I love the comment about getting striped socks... that made me snort out loud! Oh, these lists are fabulous. I know exactly what you mean about worrying about adhesive mist in the spray cans - I can't use it because the odor is too hard on my husband. Thanks for coming by, and I'm pleased you enjoyed my odd humor. Maybe your husband is like a canary in a coal mine. Perhaps I am right to be wary. Afton, your secrets made me laugh out loud. My son wants to know "what's so funny, Mommy?" Impossible to explain. These were awesome. I can relate to that. I was laughing at an ice bucket challenge gone wrong in my sewing room (http://www.mirror.co.uk/news/weird-news/hilarious-ice-bucket-challenge-backfires-4074478) when my husband popped in to see if I was ok.
You make a good point. I'm glad to know that at least the quilts I use for more than hanging on a wall definitely get washed. The decision to spray baste or pin is a no-brainer for me. I'll breathe those fumes every time rather than the pins not holding the sandwich tightly enough. With spray, it all stays together! Color catchers to the rescue! Love 'em! I wonder how someone came up with the idea. I too son't go to shops with cats. I think it's kinda rude of them to have cats and expect the public to put up with them. Dogs are good, but not many stores have store dogs, why have store cats. And why don't cats have to be on a leash? It's OK to let cats run around a neighborhood? They used to bury poo in my kids' sand box! I bet whoever came up with Color Catchers got tired of all their tightie whities turing pink. Unfortunately, I'm allergic to dogs too, but I find that they have less of a tendency to jump up on the cutting mats or rub their hairy bodies on the bolts. I have a friend who actually takes her cat for walks on a leash, but I think that's not a normal thing for people to do. I know my mom isn't a fan of cats on the loose in a neighborhood, since they ate her class pets. She's a teacher who was keeping her koi in the small pond in her front yard for the summer break. No store horse is a great idea! I'm not allergic to them, and pony rides could keep the kids entertained while I shop. Just kidding, unless you know of a quilt shop that offers free supervised pony rides for little ones. Nothing here is too scary for me. We even have some similarities. However, I think buying the striped socks would just be asking for trouble. You are safer without them. I spray baste outdoors, but use newspaper outside of the quilt because the dust/dirt will stick to the over spray where I am working. I tried on that said there were no fumes but it dried so fast that it had no stick either. But I think it's because we don't have any humidity in New Mexico.